NCBR provides a temporary sanctuary for boxers in need throughout Northern California, the Central Valley (Fresno or farther north) and around the Nevada/California state line area. We are run entirely by a dedicated group of volunteers and have no paid employees. 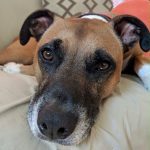 We allocate nearly 100% of our adoption fees and donations directly toward the care of our boxers, including spay/neuter surgeries, vaccinations, a microchip, and more. NorCal Boxer Rescue was founded in June of 1998 due to the need for a reputable boxer rescue organization in Northern California. In the months that followed, we worked to build the organization by developing relationships with California shelters and establishing a network of foster homes and volunteers. Within the first year of operation, NCBR had obtained its federal 501(c)(3) nonprofit status and had rescued and re-homed dozens of boxers! Since NCBR’s inception, we have had the great privilege of saving the lives of thousands of boxers and providing just as many families with a loving and loyal companion! NCBR provides a temporary sanctuary for boxers in need throughout Northern California, the Central Valley (Fresno or farther north) and around the Nevada/California state line area. We rescue boxers from shelters and from owners who are no longer able to care for them. 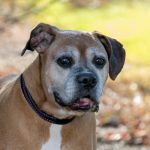 While we aim to save every boxer in need, we prioritize the most vulnerable dogs, including those who are old, ill, injured, or housed at the shelters where the risk of euthanasia is the greatest. At a minimum, we provide each of our rescued animals with veterinary care, spay/neuter surgeries, vaccinations, a microchip, a temporary foster home at a private residence, lots of love, and placement into a carefully screened forever home. NCBR is run entirely by a dedicated group of volunteers who have an unmatched love for preserving this wonderful breed. We have no paid employees and allocate nearly 100% of our adoption fees and donations directly toward the care of our boxers. NCBR has an endless number of volunteers who make this organization the success that it is. From coordinating transportation for boxers to fostering to processing applications of all types, we couldn’t do it without an army of volunteers! If you have a heart for animals, we invite you to get involved in whatever capacity you can. Check out our volunteer opportunities today! Check out our amazing volunteers’ stories on Facebook! Copyright © 2015-2018 NorCal Boxer Rescue. All images and logos on this web site are property of NorCal Boxer Rescue and may not be downloaded, used or reproduced without specific, written prior permission.